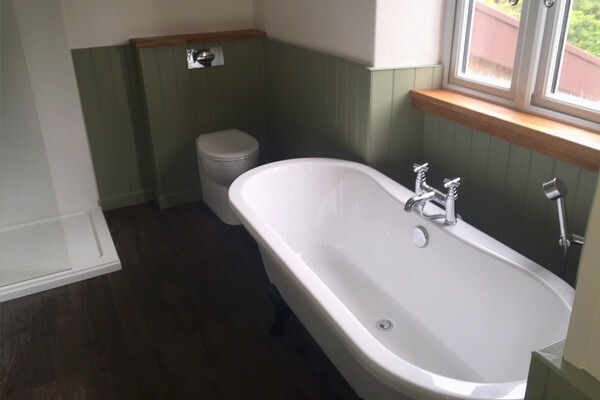 To carry out construction of main family bathroom to 19th century period property. Works included full construction of room, plastering, plumbing, drainage, electrical works and testing. 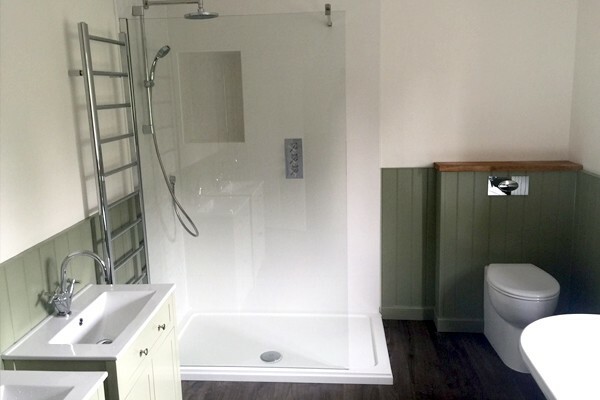 Using soft colours and clean lines offering a free standing ornate bath and walk in shower with half height panelled walls resulting in a high quality, luxurious finish to compliment this discerning property. "‘Many thanks for the recent installation. We are really happy with the final product, in addition, I’d like to also thank you for your follow-up care in ensuring everything was sealed and working once completed.’"
"'Many thanks for your excellent service as always'"
"‘We’d like to express our appreciation of the work of your staff. The craftmanship, the cleanliness and attitude of your engineers say a lot about your firm. Sinue is a credit to your company’"
"'Even when you are very busy but someone is in plumbing trouble you somehow manage to resolve the problem for them. Great service. Great 'leakbuster' team. Thank you Mathison's'"
"'I would like to pass on my sincere thanks to your company and particularly your engineers who worked long days without any major breaks to get the boiler working despite terrible weather conditions. You have a good team and they are a credit to your company'"